The C.Scope M-Scan Magnetometer is a useful handheld instrument that detects ferrous objects below ground including manholes, septic tanks, valve boxes and cast iron piping for gas and water. As the detector only picks up on ferrous metals, there is no interference from non-ferrous obstacles and it can detect a magnetic field down to a depth of 5m through its twin sensor coils. 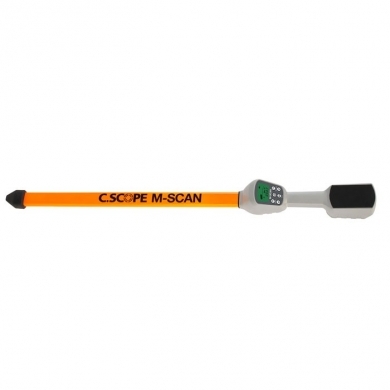 Visual and audio indications are provided by the C.Scope M-Scan. A constant low frequency tone is given out when no ferrous objects are detected and the pitch raises when the magnetometer is brought over a compatible underground object. The LCD screen indicates signal strength with a resolution of 20nT, shows polarity direction and also displays a warning when a 50Hz-60Hz power cable is detected. An analogue bar graph across the top of the screen provides further information on the signal strength. Object depth can also be estimated with this detector whilst an erase function helps negate interference from nearby metal structures like fences and shipping containers. The maximum possible signal reading is 99.9µT and audio signals can be received either by the loudspeaker or through headphones. The C.Scope M-Scan is resistant to water and dust damage (IP65-rated) thanks to its epoxy sandwich coated aluminium sensor tube and heavy duty ABS case. The magnetometer weighs just 1.3kg and has a 100-hour battery life so it is extremely practical. A handy carry case is provided as standard and the detector constitutes a really useful way of locating iron-based obstructions buried up to 5m deep in earth, gravel or snow ahead of excavation.